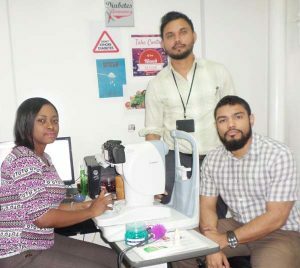 Cases of cataract, diabetic retinopathy and glaucoma have been identified as some of the more frequent conditions seen at the Ophthalmology Department of the Georgetown Public Hospital Corporation (GPHC). Dr. Shailendra Sugrim with the two optometrists on his staff. In excess of 300 patients suffering from these conditions, and others, are seen on a daily basis at the GPHC. While the majority of cataract and glaucoma cases are elderly folks, the cases of diabetic retinopathy are individuals of varying age groups. This is according to Consultant Ophthalmologist at the GPHC, Dr. Shailendra Sugrim, who assumed the position of Head of Department in 2015 following Dr. George Norton’s call to a ministerial portfolio. Dr. Sugrim gained his specialist ophthalmology training in Bangladesh where he also embraced training in glaucoma as a sub-specialty. His specialist training allowed him to be the only local candidate at the GPHC at the time to fill the void left by Dr. Norton’s departure. Since taking over the reins of the Department, Dr. Sugrim has been seeking to put several measures in place to improve the quality of eye care offered at the GPHC. Among these has been the introduction of a triage section. “We are trying to change the clinic whereby it is easier for patients to enter…They see a junior doctor first and if needed then they see a Consultant after,” said Dr. Sugrim as he stressed the importance of streamlining much needed eye surgeries. Aiding his efforts are six other ophthalmologists (both locals and foreigners). But among the most strategic of moves that have been introduced under Dr. Sugrim’s watch is the introduction of a programme to tackle diabetic retinopathy. This programme has been gaining keen support from a number of organisations including United States-based Non Governmental Organisation – Orbis International, the World Diabetes Foundation, the University of Toronto and the Ministry of Public Health. Dr. John Carter, Retinal Surgeon at the Winchester Medical Centre in Virginia, United States during a recent interview with this publication, stressed the importance of screening in order to combat diabetic retinopathy. Diabetic retinopathy occurs in persons who are diagnosed with diabetes. But the challenge associated with this condition is that it can develop to an alarming level without an individual developing noticeable signs and symptoms. This, however, must be an ongoing process whereby patients are screened annually, even if they do not develop symptoms. “What we are trying to avoid is patients waiting until their vision is bad, because often when their vision is very bad they would develop vision loss and we can’t get it back. So the treatment is most effective even before the patient notices something is wrong,” explained Dr. Carter. In order to adhere to the call for early screening, Dr, Sugrim said that the Ophthalmology Department has brought on board two Optometrists – Andrew Adams and Fionna Todd. “We’ve employed the two optometrists and they are doing the screening,” related Dr. Sugrim as he revealed that another measure that have been embraced is the training of consultants in the Ophthalmology Department so that they can better cater to patients suffering from diabetic retinopathy. According to published reports, if an individual is diagnosed with diabetes their blood glucose or blood sugar can become too high and over time this can damage their eyes. The most common outcome is diabetic retinopathy which is said to be a leading cause of blindness in adults diagnosed with diabetes. The retina is the light-sensitive tissue at the back of the eye. In order to see clearly a healthy retina is required but once diabetic retinopathy steps in it can damage the tiny blood vessels inside the retina. Although patients may not recognise the developing damage at an early stage, the symptoms of diabetic retinopathy include blurry or double vision, rings, flashing lights or blank spots, dark or floating spots, pain or pressure in one or both eyes and trouble seeing things out of the corner of the eyes. Treatment for diabetic retinopathy includes laser surgery, which according to Dr. Sugrim, is offered at the GPHC. However, according to Dr. Carter, the best option is always to find the problem at an early stage and prevent vision loss altogether. Cataract is recognised by a cloud over the lens of the eye which can be remedied surgically while glaucoma happens when pressure builds up in the eye damaging the main nerve. The latter can be addressed with eye drops or surgery too.